I usually don’t have that hard a time assigning stars for a review. Personally, I considered this a three star reading ‘experience’, but would easily recommend this book highly for other readers not familiar with the topic, so am giving it four stars. 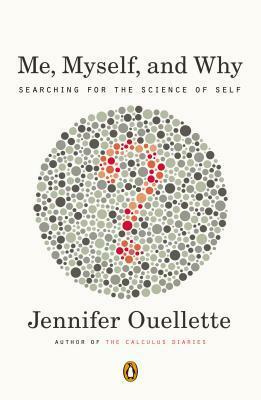 Enjoying following Jennifer Ouellette on social media, I jumped at the chance to read her new book, an explorative overview into ‘the self’. Overall the book is a success as a scientifically accurate, but lighthearted education on an incredibly complex topic that extends from hard science to the realms of philosophy and theology. For anyone familiar with Ouellette the style of the book will be instantly recognizable, a combination of awe-filled curiosity, an appreciation for learning and understanding, and a talent for communicating complexities in simple fashion, complete with analogies and references from the classical to the pop culture. For those that do have a scientific slant of curiosity but don’t know much about these topics of self – from genetics (nature) to environment (nurture) that define us to the neurological systems that form our thoughts – this book is the perfect broad overview, and offers a gigantic bibliography of materials to turn to for further information. Ouellette’s coverage of these topics works so well for the general reader because of her relation of the science in terms of personal stories and pop anecdotes. For me personally the book was a relatively quick read, and not as fascinating as I had hoped, but this is mostly due to the fact that most of the material covered was familiar to me already. Thus, for those out there who are already fairly well-read on the topics presented here, you may be disappointed that Ouellette doesn’t delve into deeper detail on the aspects of our current scientific understanding of self. At the end, readers are left with the general conclusion that the mind and the self arises from the combined interplay of a host of factors biological and nonbiological to emerge as consciousness that we are still struggling to precisely define and understand. Thus, if you are expecting a cut and dry revelation of novel and epic proportions, well, that just doesn’t exist. What you will find is an excellent primer on our current understanding of what makes ‘me’ me, and may open your eyes to fuller empathy that all individuals are truly unique, and to judge anyone without being ‘in their shoes’ biologically and completely is a horrible sin indeed. Even if you yourself know most of Ouellette covers in this book, we all certainly know people who don’t have any idea, or who may not have even thought about themselves. This book would be the perfect introduction to themselves.